Advances in School Effectiveness Research and Practice presents a worldwide state-of-the-art summary of the rapidly growing field of school effectiveness research by an internationally renowned group of authors. Current knowledge in the field is reviewed to present an integrated and coherent, internationally valid perspective on school effectiveness and instructional effectiveness. The book creatively outlines some new directions in which the field should move if it is to fulfil its promise. These include the development of international studies and the generating and testing of school effectiveness theory. For educational researchers, academics and postgraduates students in the fields of school effectiveness, instructional effectiveness, teacher effectivenes and policy makers. Preface and introduction (D.Reynolds). The State-of-the-Art School Effectiveness Research. The history, value and purpose of school effectiveness studies (B.P.M. Creemers). 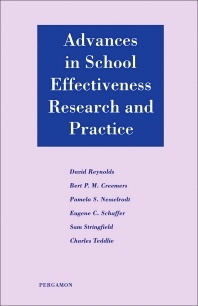 School effectiveness research: a review of the international literature (D. Reynolds et al.). Advances in Research Practice in School Effectiveness. The analysis of large data bases in school effectiveness research (S. Stringfield). Outlier studies of school effectiveness (S. Stringfield). The study of context in school effects research: history, methods, results and theoretical implications (C. Teddlie). The integration of classroom and school process data in school effects research (C. Teddlie). The contributions of classroom observation to school effectiveness research (E.C. Schaffer et al.). New Directions for School Effectiveness Research. A model of elementary school effects (S. Stringfield). Effective instruction: an empirical basis for a theory of educational effectiveness (B.P.M. Creemers). Conceptual frameworks on school effectiveness: rational control versus choice (J. Scheerens) School effectiveness - the need for an international perspective (D. Reynolds et al. ).